PLAINFIELD, N.J. -- A 67-year-old woman who was walking down a New Jersey street tripped over an open cellar door and tumbled into a basement. Surveillance cameras captured the incident on video. CBS New York spoke to the woman's son, who says he is grateful his mother wasn't killed. He emphasized that when people watch the video, it's important to understand that his mother is legally blind and diabetic. "When I first saw the video, my heart dropped," the woman's son said. "It was painful to watch." 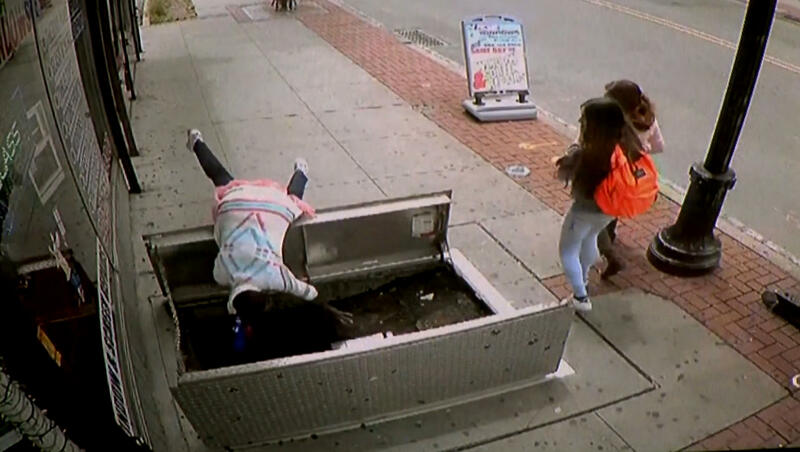 To many viewers, the video looks like a hard lesson in distracted walking — a woman coming down the street straight towards the wide open cellar doors in front of Acme Windows in Plainfield. Right before she reaches them, she looks down and then flips over the door, head first, tumbling six feet down to the basement below. Moments after she fell, fire crews arrived and rescued the woman, pulling her out of the basement on a stretcher. Police say it appears as though the woman was distracted by her cellphone. The basement doors were open for gas line repairs. "As far as I was told, when she was walking down the street she felt a little nauseous in a sense, and looked at her phone to see what time it was," the woman's son said. Police say the woman was seriously hurt, but she is now in stable condition.